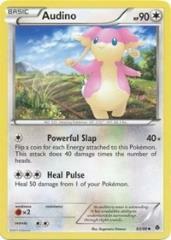 Attack 1:  Powerful Slap (40x) Flip a coin for each Energy attached to this Pokemon. This attack does 40 damage times the number of heads. Attack 2:  Heal Pulse - Heal 50 damage from 1 of your Pokemon.